Teymour was named after Timur the Lame, the great 14th Century central Asian conqueror, in memory of his parents' seven year stint in Iran which ended a few weeks before his birth. His father David Housego was an eminent foreign correspondent for the Financial Times with long postings in Paris and New Delhi, before eventually settling in India to set up the award winning designer-wear textile company Shades of India. Teymour thus spent his early years in Paris where he learnt the Western flute and moved to Delhi with his parents at the age of 12. 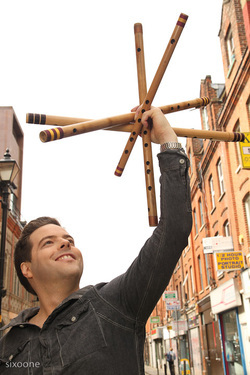 It was purely as a result of his mother not being able to find a Western flute teacher that he began learning the bansuri. This was to change his life for ever. 'I felt like a bird being let out of a cage' he chirps joyfully. 'I was immediately captivated by the removal of the written page, the discovery of improvisation, the richness of Indian melodic phrasing, the wealth of mood-evoking ragas, the playfulness of complex rhythms and the deep haunting sound of the bansuri.' He was also exposed to jazz during his teens thanks to his school's vibrant music department. By the age of 15 he knew he wanted to be a musician. His guru Shri Prakash Saxena was the head of instrumental music at the Gandharva Mahavidyalaya, New Delhi. After leaving school, Teymour went on to study there and graduated with a B.Mus having achieved the highest score in his year. After a brief stint studying jazz in Paris, he moved to London in his early twenties where he has lived ever since. He comments, 'my training in India gave me a very solid grounding and a rich musical experience but I knew in the bottom of my heart that I also wanted to explore the wealth of musical traditions and styles the world had to offer and find ways of combining my background in Indian music and jazz with other musical styles. Both London and Paris were the obvious places to be given the diversity of musicians living in these cities.' Teymour nevertheless returned to India on several occasions to continue with his training both with Shri Saxena, and more recently with the pre-eminent bansuri maestro Pandit Ronu Majumdar, for which he received a grant from Milapfest. Teymour also co-founded the flamenco fusion group Alcazaba, whose debut album was released by Universal in 2009, and has been featured prominently on several other acclaimed albums including Niraj Chag's Along the Dusty Road and Shivanova's Secret Chants. His latest album Haunting Bazaar, a sublime collection of transcultural songs and vocally-infused instrumental pieces, was described by the Financial Times as ‘fusion at its most successful’. Available to preview and download on iTunes and Amazon. Film and documentary soundtracks featuring Teymour include the National Geographic IMAX film Sea Monsters (music by Peter Gabriel and The Footnote), the zombie film The Dead (music composed by Imran Khan) and the documentary Enemies of the People (music composed by Daniel Pemberton) about the Khmer Rouge. As well as making it to the final 10 shortlist for the Oscars this acclaimed movie has since gone on to win countless awards including the Special Jury Prize at the 2010 Sundance Festival. Please click here for a full list of album, film and documentary credits. London Venues where Teymour has performed include The Royal Festival Hall, The Barbican, The Royal Albert Hall, Cargo, the Jazz Café, the Scala, Momo, the Green Note and St Ethelburga's Centre for Peace and Reconciliation. Venues outside London include the Lowry Manchester, the Sage Gateshead, Severn Arts Leeds, the Stables Milton Keynes and the Quarterhouse Folkestone amongst many others. Teymour has also performed in France, Germany, Poland, Luxembourg, Portugal and India.